Want to help Waveney with his research? Following on from my post about the Hubble diagram, I thought I’d mention a bit about the main types of galaxies that are out there. Galaxies come in three basic types: spirals, ellipticals and irregulars. Each of these three broad morphologies of galaxy tells us a little about what is going on inside the galaxy itself. They are all structured differently. 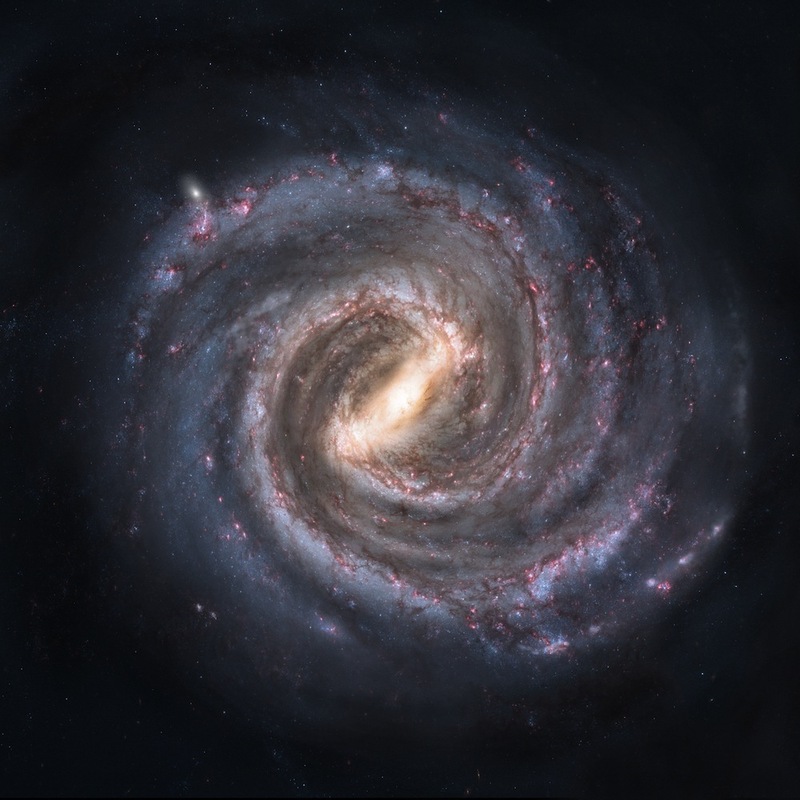 The spiral arms of a galaxy contain most of the interstellar medium – dust and other material between stars – within a galaxy. It is in the spiral arms that new stars are forming, hence their usually bright, blueish or white colour. Spirals are made of about 10-20% dust and gas. This is the source material for the stars that are forming within the spiral arms. It is the dust that obscures background light to create the dark lanes you see in spiral galaxies. You can the arms and the dust lanes very well in this artistic impression of our own galaxy, the Milky Way from Nick Risinger / NASA. The central bulge of spiral galaxy contains older, redder stars and often also contains a invisible, massive black hole. Some, but by no means all, central bulges have the appearance of a mini elliptical galaxy. The central bulge and spiral arms vary greatly in appearance from galaxy-to-galaxy. But of course, you know this from working on Galaxy Zoo! Elliptical galaxies are essentially all bulge and nothing else! 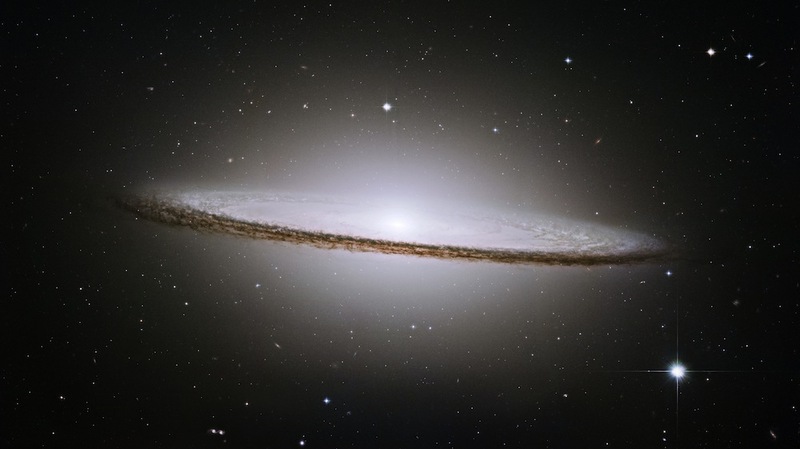 In an elliptical galaxy the stars tend to be older and there is less gas and dust around. The stars orbit around the centre of mass of the galaxy in a more random way – their orbits are not constrained to a disk shape. There is very little star formation going on in elliptical galaxies and so they usually appear reddish in colour: dominated by older, cooler stars. There is obviously little to say about the structure of irregular galaxies because they are irregular. They make up about a quarter of all galaxies. It is thought that many irregulars were once ellipticals or spirals and have been distorted by interactions or collisions with other galaxies. Irregular galaxies can have very high star formation rates and can contain a lot of dust and gas – often more than spiral galaxies. Galaxy Zoo: Hubble has a whole new branch of questions to try and help classify these clumpy galaxies. You could add this fourth category to the list of galaxy types. Dwarf galaxies might appear to be just smaller versions of the above types, but they are the most common type of galaxy. There are more dwarfs than any of the others, if you just count them up. The Large and Small Magellanic Clouds – the LMC and SMC, which are visible in the Southern Hemisphere – are actually two small galaxies, orbiting around our own larger Milky Way. The image below, from Mr. Eclipse, shows both of these objects. 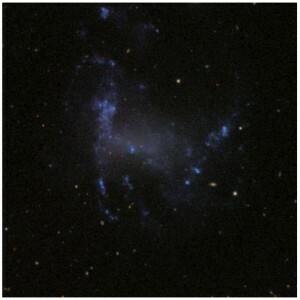 The LMC is an irregular galaxy and the SMC is a dwarf. We’ll continue talking about the different types of galaxies – and how they all fit together – in the next post in this series. In the meantime might I suggest yet another type of galaxy, perhaps with a coffee and a bit of classification? Aida Berges (“lovethetropics“) lives in Puerto Rico with her husband and children. Originally from the Dominican Republic, she studied there in an all girl Catholic school (Colegio del Apostolado) where she was inspired by her her history teacher (Rosa Maria Reyes Feriz). After graduation she started a university degree in Law where Supreme Court Judge Ana Rosa Berges Dreyfuss (a family member) became a beloved teacher. After finishing her degree in English at a different university, she worked various secretarial jobs and as a translator. She moved to Puerto Rico to live with her eldest brother and his wife, and there met husband (Benito Garcia Mendez). Her main job for the last almost 30 years has been as a dedicated wife and mother to children Benny and Laura (now grown; Benny works in retail and Laura is finishing her Masters’s degree in Psychology). The family spent most of this time in Puerto Rico, except for a 7 year spell in New Jersey where the children were born. Aida loves to read history, science fiction and fantasy. She has 3 dogs and one cat. And she loves the ocean, especially going to the beach or just watching the waves. How did you first hear about Galaxy Zoo? I was reading CNN online and found an article describing how a very young teacher from the Netherlands had found a new kind of object and it was called Hanny’s Voorwerp. It was an article to celebrate the first year of Galaxy Zoo. I went to Galaxy Zoo immediately and my life changed forever…It was like coming home for me. What has been your main involvement in the Galaxy Zoo project? I am part of the Irregulars Project and also the Hyper-Velocity Stars Project (and check out their blog). In the Irregulars Project I look for irregulars galaxies and send them to Richard Proctor to be integrated into the hunt. We now have more than 17,000 irregulars and the numbers keep growing every day. And we still need the help of the Zooites with their clicks on the Irregular Hunt (check out the Irregulars Project forum discussion). I send Richard between 100 and 500 possible irregulars every week. I also worked on the three Pea hunts, the Mergers hunt, the Voorwerpjes hunt and the Supernova hunt. And I found an unusual green object ages ago which has been dubbed Aida’s disturbed green mystery object and has been an object of the day (OOTD). We still don’t know what it is. Both major projects I’m involved have been pure coincidence or serendipity. With the Irregulars Project I was the one getting the galaxies for the hunt and when we decided to write the first paper about astronomy without being astronomers I was included. I classified by myself 24,000 galaxies to clean the sample from spirals, elliptical galaxies, artifacts and unidentifiable blobs. Then classified 12,000 more! What do you like most about being involved in Galaxy Zoo? What I like the most is helping scientists discover new things and being there when that happens. And the people at the Zoo are wonderful, starting with the Moderators, Zookeepers and Zooites. For me it feels like coming home. What do you think is the most interesting astronomical question Galaxy Zoo will help to solve? With every question we answer we get ten new questions. First I would like to know the place of the Irregular Galaxies in the universe. Then would like to know if there are other Voorwerpen and would like to know how the Voorwerpje saga ends. And how the spiderweb ring galaxies (Eds note: Aida’s name for ring galaxies with very low surface brightness extended rings like this one) are formed. They are the most beautiful galaxies for me. 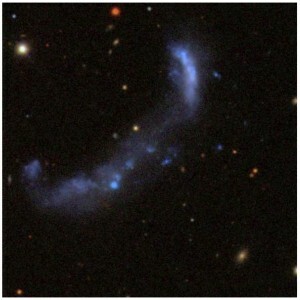 And how the shockwave ring galaxies are formed too. So many questions, so little coffee. How/when did you first get interested in Astronomy? When I was young I lived in the country so the moon and stars were spectacular…ever since I first saw the stars I have been interested. I started to surf the internet because I wanted to read everything I could about astronomy. What (if any) do you think are the main barriers to women’s involvement in Astronomy? Well, I come from a third world country, the Dominican Republic. In my time girls were supposed to marry young and be housewives, but now I see that the universities there are full of women studying and that makes me so proud. There are no barriers now for us, maybe just a few reluctant men, but we are winning. Do you have any particular role models in Astronomy? I would have to say that the Zookeepers are my role models because before getting involved on Galaxy Zoo I didn’t know any astronomers. Chris Lintott and Jordan Raddick specially because we are doing the Irregulars Project together. And Jordan Raddick is double because he is helping us with the HVSs. And Bill Keel (NGC3314), I am helping him get more possible Voorwepjes. Thomas Jennings started the Newbies thread and has gone back to college to study Astronomy. That’s what I call commitment. The person who inspired me to love science in general was my sister Adolfina. She is a medical doctor with specialties in Pediatrics and Hematology. She and her husband, who is also a hematologist discovered an element in the blood unknown until they found it. She is also the best and most loving sister anyone can have. Hanny Van Arkel (Galaxy Zoo volunteer and finder of Hanny’s Voorwerp). Dr. Vardha Nicola Bennert (researcher at UCSB involved in Hanny’s Voorwerp followup and the “peas” project). Alice Sheppard (Galaxy Zoo volunteer and forum moderator). Carie Cardamone (graduate student at Yale who lead the Peas paper). Gemma Couglin (“fluffyporcupine”, Galaxy Zoo volunteer and forum moderator). Dr. Kate Land (original Galaxy Zoo team member and first-author of the first Galaxy Zoo scientific publication; now working in the financial world). Still to come in the series – more Galaxy Zoo volunteers and researchers. We’re not done yet!